We always strive to provide a professional and efficient service, however we recognise that it is in the nature of insolvency proceedings for disputes to arise from time to time. If you should have cause to complain about the way that we are acting, you should, in the first instance, put details of your complaint in writing to either Andrew McTear or Chris Williams. We will endeavour to deal with your complaint under the supervision of a senior director unconnected with the appointment. Most disputes can be resolved amicably either through the provision of further information or following negotiations. However, in the event that you have exhausted our complaints procedure and you are not satisfied that your complaint has been resolved or dealt with appropriately, you may refer your complaint to The Insolvency Service, IP Complaints, 3rd Floor, 1 City Walk, Leeds, LS11 9DA; and you can make a submission using an online form available at www.gov.uk/complain-about-inso...; or you may email insolvency.enquiryline@insolvency.gsi.gov.uk; or you may phone 0300 678 0015 - calls are charged at up to 12p per minute from a land line or for mobiles between 3p and 45p per minute if you are calling from the UK. 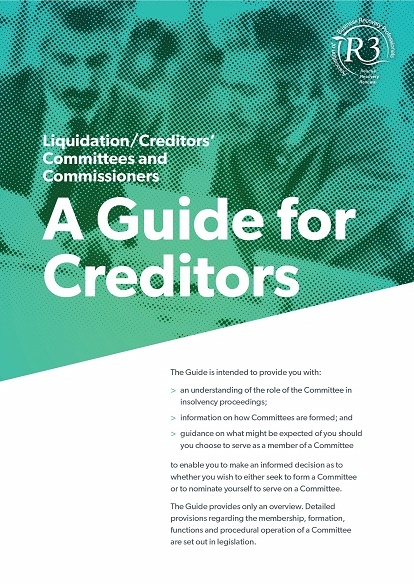 Here we provide a general guide to insolvency which takes you through the waterfall of insolvency options from least to most severe and brief guides to the most common types of corporate insolvency procedures. Simply click here to access our guides to insolvency. To improve communications and reduce costs creditor/shareholder reports and other documents are published below. As a creditor you will have received written notification of a login and password which provides access to reports and other information. Click here to access the login page to download reports and other documents. We do as much as we can to be open and transparent about our fees and the costs associated with all the work we do. Like most professionals our normal basis of charging is on time costs based on charge out rates which vary depending on the grade and experience of individuals involved. We believe that our charge out rates are very competitive and we provide a more personal but otherwise similar level of service to the larger national business rescue and insolvency firms but at around half the price. We don't charge for initial meetings and won't charge until we agree the terms of an engagement with you. The only exception to this is non business related cases (for example consumer credit card problem debt) where we will charge a fixed fee for initial meetings. We always agree a basis for charging before work commences – usually in accordance with the time spent on your case but sometimes on a percentage of results achieved. If we are charging on a time basis we will give you an estimate of the total fee and agree further fees if necessary. In formal insolvency appointment cases we normally charge on a time basis subject to the law and guidelines laid down by our professional body listed below. Click the download links in the first table to view our charging and disbursement policies for appointments pre and post 1 October 2015 and in the second table to view the official creditor guides. We believe these are very competitive and about half of costs charged by national firms. The Insolvency Service have reviewed their guidance publications and have begun the process of replacing the existing Word and PDF documents with new web based content, these publications can be found here.